Mechanized infantry is distinguished from motorized infantry in that its vehicles provide a degree of protection from hostile fire, as opposed to "soft-skinned" wheeled vehicles (trucks or jeeps) for motorized infantry. Most APCs and IFVs are fully tracked, or are all-wheel drive vehicles (6×6 or 8×8), for mobility across rough ground. 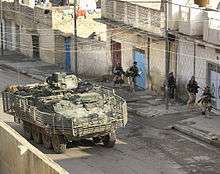 Some nations distinguish between mechanized and armoured infantry, designating troops carried by APCs as mechanized and those in IFVs as armoured. The support weapons for mechanized infantry are also provided with motorized transport, or are built directly into combat vehicles, in order to keep pace with the mechanized infantry in combat. For units equipped with most types of APC or any type of IFV, fire support weapons, such as machine guns, autocannons, small-bore direct-fire howitzers, and even anti-tank guided missiles, are often mounted directly on the infantry's own transport vehicles. Compared with "light" truck-mobile infantry, mechanized infantry can maintain rapid tactical movement and (if mounted in IFVs) possess more integral firepower. They require more combat supplies (ammunition and especially fuel) and ordnance supplies (spare vehicle components), and a comparatively larger proportion of their manpower is required to crew and maintain the vehicles. For example, most APCs mount a section of seven or eight infantrymen, but have a crew of two. Most IFVs only carry six or seven infantry, but require a crew of three. To be effective in the field, mechanized units also require large numbers of mechanics with specialized maintenance and recovery vehicles and equipment. Arguably, the first mechanized infantry were 36 two-man infantry squads carried forward by Mark V* tanks at the Battle of Amiens in 1918. In a battle of such scale, their contribution went unnoticed. Towards the end of World War I, all the armies involved were faced with the problem of maintaining the momentum of an attack. Tanks, artillery or infiltration tactics could all be used to break through an enemy defense, but almost all the offensives launched in 1918 ground to a halt after a few days. Following infantry quickly became exhausted, and artillery, supplies and fresh formations could not be brought forward over the battlefields quickly enough to maintain the pressure on the regrouping enemy. It was widely acknowledged that cavalry was too vulnerable to be used on most European battlefields, although many armies continued to deploy them. Motorized infantry could maintain rapid movement, but their trucks required either a good road network, or firm open terrain (such as desert). They were unable to traverse a battlefield obstructed by craters, barbed wire and trenches. Tracked or all-wheel drive vehicles were to be the solution. Following the war, development of mechanized forces was largely theoretical for some time, until many nations began rearming in the 1930s. The British Army had established an Experimental Mechanized Force in 1927, but they failed to pursue this line due to budget constraints and the prior need to garrison the frontiers of the Empire. Although some proponents of mobile warfare—such as J. F. C. Fuller—advocated building "tank fleets", others—such as Heinz Guderian in Germany, Adna R. Chaffee Jr. in the United States, and Mikhail Tukhachevsky in the Soviet Union—recognized that tank units required close support from infantry and other arms, and that these supporting arms needed to maintain the same pace as the tanks. As the Germans rearmed in the 1930s, they equipped some infantry units in their new Panzer (armored) divisions with the half-track Sd.Kfz. 251, which could keep up with tanks on most terrain. The French Army also created "Light Mechanized" (Légère Mécanisée) divisions in which some of the infantry units possessed small tracked carriers. Together with the motorization of the other infantry and support units, this gave both armies highly mobile, combined-arms formations. The German doctrine was to use these to exploit breakthroughs in Blitzkrieg offensives, the French envisaged them being used to shift reserves rapidly in a defensive battle. As World War II progressed, most major armies integrated tanks or assault guns with mechanized infantry (and other supporting arms such as artillery and engineers) as combined arms units. Allied armored formations included a mechanized infantry element for combined arms teamwork. For example, U.S. armored divisions had a balance of three battalions each of tanks, armored infantry, and self-propelled artillery. U.S. armored infantry were fully equipped with M2 and M3 halftracks. 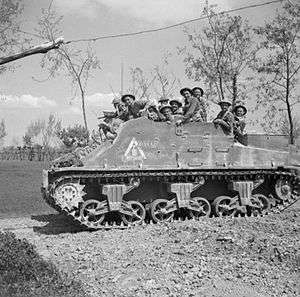 In the British and Commonwealth armies, "Type A Armoured Brigades"—which were intended for independent operations or to form part of armored divisions—had a "motor infantry" battalion mounted in Bren Carriers or later in Lend-Lease halftracks. "Type B" brigades lacked a motor infantry component and were subordinated to infantry formations. The Canadian Army, and subsequently the British Army also, used expedients such as the Kangaroo APC, usually for specific operations rather than to create permanent mechanized infantry formations. The first such operation was Operation Totalize in the Battle of Normandy which, although it failed to achieve its ultimate objectives, nevertheless showed that mechanized infantry could incur far fewer casualties than dismounted troops in set-piece operations. The German Army, having introduced mechanized infantry in their Panzer divisions, later named them Panzergrenadier units. In the middle years of the war, they created entire mechanized infantry divisions, which they named Panzergrenadier divisions. Because the German economy could not produce adequate numbers of their half track APC, barely a quarter or a third of the infantry in Panzer or Panzergrenadier divisions was mechanized, except in a few favored formations. The rest were moved by truck. However, most German reconnaissance units in these formations were also primarily mechanized infantry and could undertake infantry missions when needed. The Allies generally used jeeps, armored cars or light tanks for reconnaissance. The Red Army began the war while still in the process of reorganizing its armored and mechanized formations, most of which were destroyed during the first months of the German invasion of the Soviet Union. About a year later, the Soviets recreated division-sized mechanized infantry units termed Mechanized Corps, usually consisting of one tank brigade and three mechanized infantry brigades, with motorized supporting arms. They were generally used in the exploitation phase of offensives, as part of the pre-war Soviet concept of Deep operations. The Soviet Army also created several Cavalry mechanized groups in which tanks, mechanized infantry and horsed cavalry were mixed. These were also used in the exploitation and pursuit phases of offensives. Red Army mechanized infantry were generally carried on tanks or trucks, with only a few dedicated Lend-lease half-track APCs. The New Zealand Army ultimately fielded a division of roughly similar composition to a Soviet Mechanized Corps, which fought in the Italian Campaign, although it had little scope for mobile operations until near the end of the war. ARVN M113 APC with added side mounted .30 caliber machine gun, in Vietnam. In the post-war era, the early years of the Cold War, the Soviet Red Army and NATO further developed the equipment and doctrine for mechanized infantry. With the exception of airborne formations, the Red Army mechanized all its infantry formations. Initially, wheeled APCs (e.g. the BTR-152) were used, some of which lacked overhead protection and were therefore vulnerable to artillery fire. This nevertheless gave the Soviet Army greater strategic flexibility, given the large land area and long borders of the Soviet Union and its allies in the Warsaw Pact. The U.S. Army established the basic configuration of the tracked APC with the M75 and M59 before adopting the lighter M113, which could be carried by Lockheed C-130 Hercules and other transport aircraft. The vehicle gave infantry the same mobility as tanks, though with much less effective armor protection (but with nuclear, biological, and chemical protection). In Vietnam, the M113 was often fitted with extra armament and used as an ad-hoc Infantry Fighting Vehicle. Early operations by the Army of the Republic of Vietnam using the vehicle showed that troops were far more effective while mounted in the vehicles than when they dismounted. American doctrine subsequently emphasized mounted tactics. The Americans ultimately deployed a mechanized brigade and ten mechanized battalions to Vietnam. Even more important for future developments was the Soviet BMP-1, which was the first true Infantry Fighting Vehicle (IFV). Its introduction prompted the development of similar vehicles in Western armies, such as the West German Marder and American M2 Bradley. 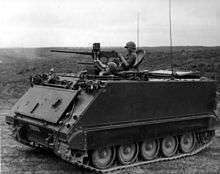 Unlike the APC (which was intended merely to transport the infantry from place to place under armor), the IFV possessed heavy firepower that could support the infantry in attack or defense. Many IFVs were also equipped with firing ports from which their infantry could fire their weapons from inside, although these were generally not successful and have been dropped from modern IFVs. Soviet organization led to different tactics between the "light" and "heavy" varieties of mechanized infantry. In the Soviet Army, a first-line "Motor Rifle" division from the 1970s onward usually had two regiments equipped with the wheeled BTR-60 APC and one with the tracked BMP-1 IFV. The "light" regiments were intended to make dismounted attacks on the division's flanks, while the BMP-equipped "heavy" regiment remained mounted and supported the division's tank regiment on the main axis of advance. Both types of infantry regiment nevertheless were officially titled "Motor Rifle" units. A line of development in the Soviet Armed Forces from the 1980s was the provision of specialized IFVs for use by their airborne forces. The first of these was the BMD-1, which had the same firepower as the BMP-1, but which could be carried in or even parachuted from the standard Soviet transport aircraft. This made airborne formations into mechanized infantry at the cost of reducing their "bayonet" strength, as the BMD could carry only three, or at most four, paratroopers in addition to its three-man crew. They were used in this role in the Soviet invasion of Afghanistan in 1979. At present, almost all infantry units from industrialized nations are provided with some type of motor transport. Infantry units equipped with IFVs rather than lighter vehicles are commonly designated as "heavy", indicating more combat power but also more costly long-range transportation requirements. In Operation Desert Shield, during the buildup phase of the 1st Gulf War, the U.S. Army was concerned about the lack of mobility, protection and firepower offered by existing rapid deployment (i.e., airborne) formations; and also about the slowness of deploying regular armored units. The experience led the U.S. Army to form combat brigades based on the Stryker wheeled IFV. In the British Army, "heavy" units equipped with the Warrior IFV are described as "Armoured Infantry", and units with the Bulldog APC as "Mechanised Infantry". This convention is becoming widespread; for example the French Army has "Motorisées" units equipped with the wheeled VAB and "Mécanisées" (armoured) units with the tracked AMX-10P. The transport and other logistic requirements have led many armies to adopt wheeled APCs when their existing stocks of tracked APCs require replacement. An example is the Canadian Army, which has used the LAV III wheeled IFV in fighting in Afghanistan. On the other hand, the Italian, Spanish and Swedish armies are adopting (and exporting) new indigenous-produced tracked IFVs. 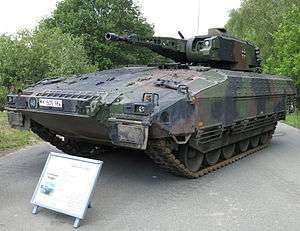 The Swedish CV90 IFV in particular has been adopted by several armies. A recent trend seen in the Israel Defense Forces and the Armed Forces of the Russian Federation is the development and introduction of exceptionally well-armored APCs (HAPC), such as the IDF Achzarit, that are converted from obsolete Main Battle Tanks (such as the Russian T-55). Such vehicles are usually expedients, and lack of space prevents the armament of an IFV being carried in addition to an infantry section or squad. In the Russian Army, such vehicles were introduced for fighting in urban areas, where the risk from short range infantry anti-tank weapons, such as the RPG-7, is highest, after Russian tank and motor infantry units suffered heavy losses fighting insurgents in Grozny during the First Chechen War in 1995. Many APCs and IFVs currently under development are intended for rapid deployment by aircraft. New technologies that promise reduction in weight, such as electric drive, may be incorporated. However, facing a similar threat in Post-invasion Iraq to that which prompted the Russians to convert tanks to APCs, the occupying armies have found it necessary to apply extra armor to existing APCs and IFVs, which adds to the overall size and weight. Some of the latest designs (such as the German Puma) are intended to allow a light, basic model vehicle, which is air-transportable, to be fitted in the field with additional protection, thereby ensuring both strategic flexibility and survivability. Ratel IFV of the South African Army, the first wheeled IFV to see significant combat. It is generally accepted that single weapons system types are much less effective without the support of the full combined arms team; the pre-World War II notion of "tank fleets" has proven to be as unsound as the World War I idea of unsupported infantry attacks. Though many nations' armored formations included an organic mechanized infantry component at the start of World War II, the proportion of mechanized infantry in such combined arms formations was increased by most armies as the war progressed. The lesson was re-learned, first by the Pakistani Army in the 1965 War with India, where the nation fielded two different types of armored divisions: one which was almost exclusively armor (the 1st), while another was more balanced (the 6th). The latter division showed itself to be far more combat capable than the former. Having achieved spectacular successes in the offensive with tank-heavy formations during the Six Day War, the Israeli Defense Force found in the Yom Kippur War of 1973 that a doctrine that relied primarily on tanks and aircraft had proven inadequate. As a makeshift remedy, paratroopers were provided with motorized transport and used as mechanized infantry in coordination with the armor. ↑ Wilmot, Chester (1952). Struggle for Europe. London: Collins. p. 413. ↑ Suvorov, Viktor (1982). Inside the Soviet Army. Book Club Associates. p. 112. Dunstan, Simon. Vietnam Tracks: Armor In Battle 1945–1975. 1982 edition, Osprey Publishing; ISBN 0-89141-171-2. Starry, Donn A., General. Armored Combat In Vietnam. 1980, Arno Press Inc. ISBN 0-672-52673-5.